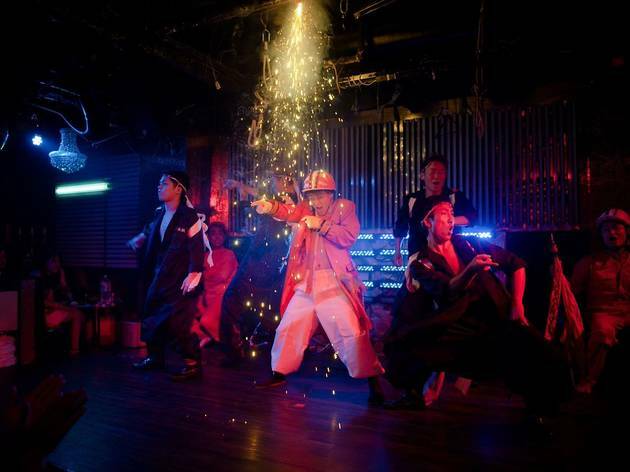 Although Dragon Tokyo is classed, at least by its owner, as a 'show pub', it's more like an unusual mix of comedic routines and an amateur strip show. It's a late-night gig – they only open at midnight – so you have to wonder about the clientele it's targeted at. The cast is all male and they switch between a bit of dancing, a bit of half-hearted 'Magic Mike', and a bit of rip-off style comedy. Be prepared to find yourself faced with more than one Full Monty. In fact, you may even find yourself holding one end of a long, exaggerated elastic band and letting it go, only to watch it snap back and hit one of the crew where the sun don't shine. Fans of ‘Jackass’ will relish the live crude action, and one thing's for sure, you'll definitely leave with a good story to tell. Learn more about 'show pub' culture here.